You’re a foodie and a film fan who’s seen Big Night. You were wowed by the Timpano. You’ve wanted to make it ever since but find the idea of recreating Stanley Tucci’s Timpano recipe daunting. Intimidating. Don’t be silly. The Big Night Timpano is just a pasta bake. The ultimate pasta bake. I had wanted to make this since I had seen the movie in the late 90’s. As my daughter’s 1st birthday was approaching, and intended as more of a party for adults, this seemed as special occasion as any to finally get round to making this. Also known as a Timballo, this Big Night Timpano recipe is based on a family recipe of co-star, co-writer, and co-director Stanley Tucci. It is a dish that any foodie and/or film fan should make at least once in their life. 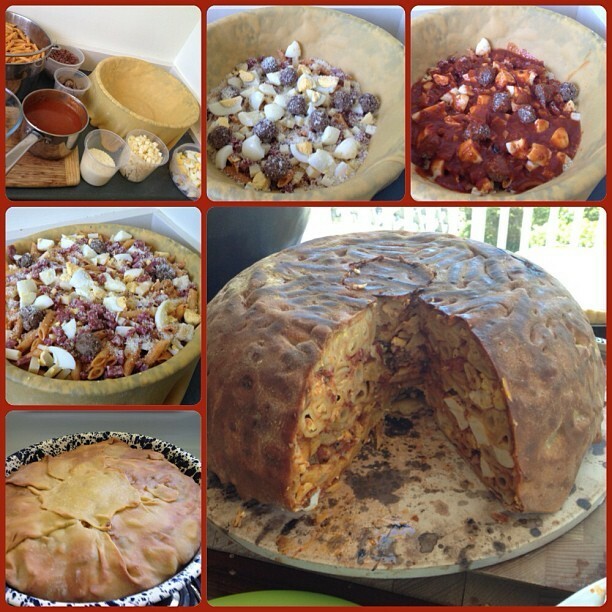 Everything you need is likely available from your local butcher, deli, or supermarket – except, the 14″ Timpano Bowl. It’s the best thing for baking this in. I had to order this enamel basin in from US Amazon, and it was perfect for this. Take your time with this dish. To get it right, I would give yourself two days. Analyse this Stanley Tucci Timpano recipe. Spend a long afternoon shopping for ingredients. Make the sauce ahead of time. Prepare the eggs, cheese, and salami a day before. Early morning, boil the pasta and cool it ready for assembly. After baking let it rest. And rest. A good hour will allow this settle nicely and let the treasure trove of flavours be absorbed by pasta inside. But don’t leave it to rest in the kitchen. Have it on display to your guests. Let the anticipation build about what delights await inside. This is a dish that deserves to be eagerly anticipated, not least because of the effort you’ve put into it. As this ‘Big Night’ Timpano was adapted from Tucci’s American recipe, I’ve attempted to update the imperial measurements with metric ones. Also, confession time – I used meatballs made by the butcher. If you want to be REALLY authentic, you can use Stanley Tucci’s meatball recipe. 1. Warm olive oil in a large pot over medium-high heat. Brown beef until coloured on all sides, about 10 minutes. Set aside in a bowl. 3. Stir onions and garlic into pot. Reduce heat to low and cook until onions begin to soften, about 5 minutes. Stir in wine, scraping bottom of the pot clean. Add tomato paste. Pour 125ml cup warm water into tomato paste can to loosen any residual paste and then pour into pot. Cook to warm the paste through, about 2 minutes. Add tomatoes along with additional 250ml warm water. Stir in basil and oregano. Cover with lid partially on and simmer about 30 minutes. 4. Return meat to pot, along with any juices that accumulated in bowl. Cover partially with lid and simmer, stirring frequently, until meat is very tender and tomatoes are cooked, about 2 hours. Warm water may be added to sauce, in 125ml portions, if it becomes too thick. Grease the baking pan generously with butter and olive oil. Fold dough in half and then in half again, to form a triangle, and place in pan. Open dough and arrange it in the pan, gently pressing it against the bottom and the sides, draping extra dough over the sides. Set aside. 1. Heat oven to 180c. Have salami, provolone, hard-boiled eggs, meatballs and ragù sauce at room temperature. Stir 125ml water into sauce to thin it. Toss pasta with olive oil and allow to cool slightly before tossing with 500ml sauce. 2. Layering the filling: Distribute 4 generous cups of pasta on bottom of timpano. Top with 1 cup salami, 1 cup provolone, 3 eggs, 1 cup meatballs and 1/3 cup Romano cheese. Pour 2 cups sauce over ingredients. Repeat process to create additional layers until filling comes within 1 inch of the top of the pan, ending with 2 cups sauce. Pour beaten eggs over the filling. 3. Fold pasta dough over filling to seal completely. Trim away and discard any double layers of dough. Make sure timpano is tightly sealed. If you notice any small openings cut a piece of trimmed dough to fit over opening. Use a small amount of water to moisten these scraps of dough to ensure that a tight seal has been made. 4. Bake until lightly browned, about 1 hour. Cover with foil and continue baking until the timpano is cooked through and the dough is golden brown (and reaches an internal temperature of 120c), about 30 minutes. Remove from oven and allow to rest for 30 or more minutes to allow timpano to cool and contract before attempting to remove from pan. The baked timpano should not stick to the pan. To test, gently shake pan to the left and then to the right. It should slightly spin in the pan. If any part is still attached, carefully detach with a knife. 5. To remove timpano from pan, place a baking sheet or thin cutting board that covers the entire diameter on the pan on top of the timpano. Grasp the baking sheet or cutting board and the rim of the pan firmly and invert timpano. Remove pan and allow timpano to cool for at least 30 minutes. Using a long, sharp knife, cut a circle about 8cm in diameter in the center of the timpano, making sure to cut all the way through to the bottom. Then slice timpano as you would a pie into individual portions, leaving the center circle as a support for the remaining pieces. The cut pieces should hold together, revealing the layers of filling you built up earlier. For more great recipes from Stanley Tucci, check out The Tucci Cookbook: Family, Friends and Food (with the Timpano recipe) and his most recent book The Tucci Table: Cooking with Family and Friends. Next Next post: Labour’s Paternity Leave Policy: Is it even a step in the right direction?